Tehani has written for magazines and newspapers both as a reporter and a columnist. The majority of her work has been published on the subjects of artivism (art and activism) and comparative sacred world dance. Connect with us directly for copies of articles and/or resources on these subjects. New articles published will be posted in the News section of this website and also sent out through our newsletter. Publishing highlights are posted in the About section of this website. 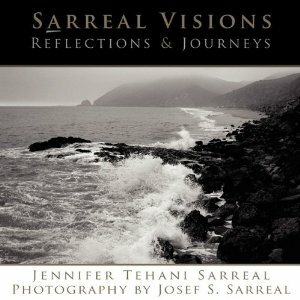 SaRREAL VISIONS: Reflections & Journeys is a passion project and labor of love. What began as a book collaboration between a photographer father and writer daughter culminated into a loving tribute to Tehani's late father. Thank you for supporting independent authors. A new book on the Spirit Dance Method TM by Jennifer Tehani Sarreal (its creator) is on its way! We have interest from a major publishing company and are currently having artwork approved to share this method with the world and to supplement current students and workshop participants' understanding of the base method - created by Sarreal - itself. We will post on our news page and to our newsletter as our team progresses in this process to publication.